Spiritual quotes contain gems of wisdom that help you to unlock your internal desires and jump into the life you’ve been longing for. They give you a different perspective on life, and help you to find peace today’s world. Some quotes have the power to change your entire life. 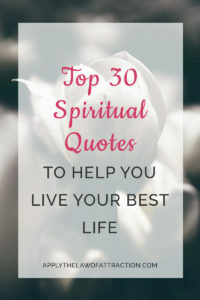 Here are 30 spiritual quotes that you will help you transition towards living your best life. I hope these spiritual quotes help you live your best life as much as they helped me!